After the needful is done we finally get back to exploring the area that produced the tourmaline now dubbed ‘Big Blue’. In the back of our mind though is the worry that our underground mining has brought us very close to the upper water filled pit. 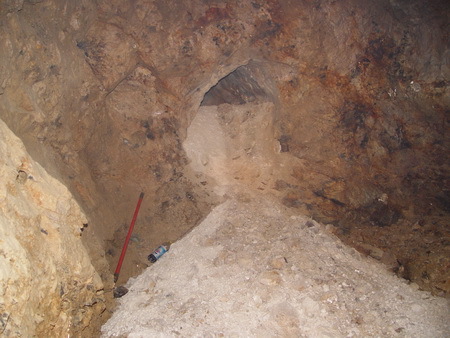 The upper pit was started by Loren Merrill and Oliver Stone in 1891 over a hundred years ago. 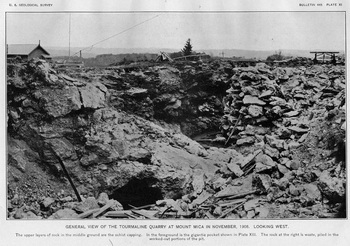 In 1891 Loren Merrill and Stone examined the surface of the ledge to the eastward of the pit, with the view of an exploration if a close investigation warranted the expenditure of time and money. 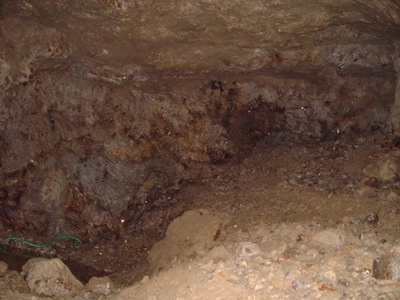 About forty feet to the eastward of the pit some Cleavelandite was visible, with black tourmaline and smoky quartz, the combination of which was favorable to the occurrence of tourmaline deposits ; and, moreover, this spot was the identical place where Mr. Hamlin found the first specimen. So the young mineralogists resolved to explore the ledge at this part, and almost the first blast revealed the existence of extensive deposits which had long been unsuspected by the many explorers who had examined the ledge for more than half a century. As we mined I tried to keep our map of the underground workings updated and accurate. (See the map at the bottom of the page). This task was not a simple as it seems. Our rudimentary methods involve using a compass and a tape. Though the tape was accurate, the compass readings were subject to 10+ degrees of error. This implied a possible 25’ of uncertainty for each 100’. Fortunately we had several holes drilled from the surface into the underground workings that provided reference points. So ,with this potential magnitude of error as we approached the upper water filled pit, our concerns increased. Finally, to help establish our location underground, we tried to drill to the outside at a point comfortably above (we hoped) the water level of the pit outside. 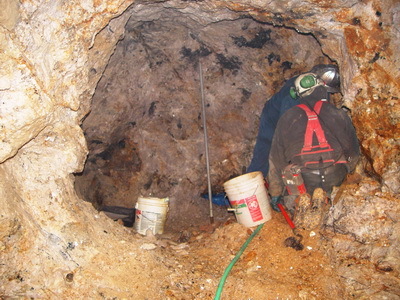 To our surprise, when the hole broke through to the outside there was only 6’ of pegmatite between us and daylight. This was uncomfortably close making the wall quite thin and calling into question the structural integrity of the face. There had been extensive blasting done on the other side of the wall in the upper pit. The compromise to the rock from the blasting was an unknown. Though we were closer to the outside than our mapping predicted, we did breach outside relatively close to where our map showed. In addition, we were just feet from the Merrill Pocket. It appears our gem pocket of September, 6-07, was part of the enriched mineralization that produced Merrill’s big find. Though 6-07 produced more than 4 kgs of gem crystals, Merrill’s pocket was reported not to be a gem producer. However, it did produce the largest tourmaline found at Mount Mica to that time. 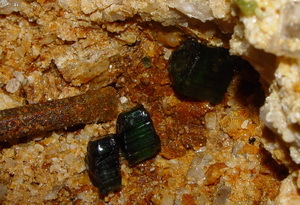 This find has since exceeded by (2) of the tourmalines found in the November pocket of 2004 (28-04). Now that we had determined we where uncomfortably close to the upper pit, we needed to take care how we mined further in this area. Caution would require us to turn our drift to run parallel to the outside with a small bias to the inside. This would increase the wall thickness as we progressed . So, with this in mind , we turned our mining more westerly and extracted the little we could take on the upper level of our advance. We also explored to the northeast. This brought us within a few feet of the underground effort put in by Plumbago Mining in the 1970’s. Here too the mineralization looked quite promising but there was little remaining to mine at the far end of this advance. We did have the option to retreat back to the SE and mine down dip from the Plumbago underground workings. We'll do that eventually or perhaps the next generation will . As we gingerly planed the walls we found a number of small spaces similar to the pockets we found in January. Each was enclosed in microcline feldspar that became increasingly more blocky and loose as the margin of the cavity was reached. 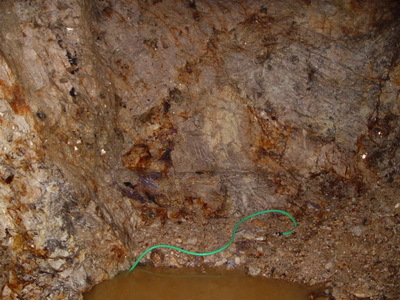 The image to the left shows one of the pockets (water puddle) and the surrounding mineralization. Note the aurora of the pocket in the surrounding feldspar. The banding of the feldspar, which we have dubbed 'zebra spar', is one of indicators on our ever expanding list of 'never miss dead gievawasy'' of a nearby space. In November, while I was away in Germany, Richard and Mike O'Neill had explored an area just on the other side of the wall to the Merrill room. Here they found a sizeable mass of lepidolite. However, the steep dip hindered their work . In April we again attempted to access this area as we mined to the northwest. This placed us on the extreme low side of the our two level area shown above. The intensive but slow build up of oxidation stains of the walls on the other side in the Merrill Room was a indication this area was good. This staining, probably iron and manganese oxides, develops in patches on the up dip walls and is related to the mineralization up dip. Leached out, the once anoxic solutions oxidize to dark stains. On May 12 pocket 5 of '08 we discovered just behind one of these stained areas. Probably the best piece from this space was a tabular green/blue beryl. 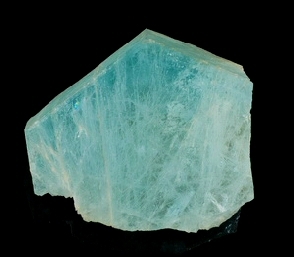 Once exposed to light, the green faded quickly leaving the crystal decidedly blue. 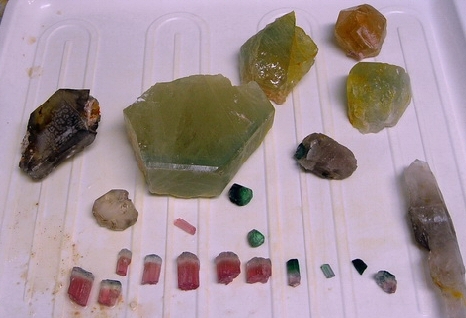 The were several nice tourmaline sections as well. The photo above shows the main pieces fom the find. When found the beryl was a green-yellow color. The image at the left, taken by Henry Minot, is of the same crystal. Its final blue color evident. I would like to meet with you to discuss the activities at your Mount Mica Mine. I have unsuccessfully attempted to contact you at the two numbers that I have on record. Please contact me at the number below or respond by e-mail. Mine Health and Safety Administration. Like Valerie Plame, we'd been outed. The 'Federales' were wise to us. Actually, I had raised my hand 'excuse me fashion' some years ago. At that time we had been fortunately classified a 'hobby mine' and filed away at the back of some drawer. We were opertaing open cast (pit) at that time. Apparently a picture in Cross Jeweler's 2007 Thanksgiving supplement in the Portland, Maine newspapers showing the portal of of our underground workings was revealed exposé fashion at some MSHA regional pow-pow. The reaction was quick. ( Secretly obtained audio of the raucous reaction at the meeting :-) Click to play. The blind eye had now been restored 20-20+ and our file was dusted off prompting the email above. MSHA was coming for a CAV (courtesy assessment visit). I feared the bulldozers would be idling just out of sight post the CAV... West Bank style. As it turned out, the visit went well. With the help of the MSHA Small Mines Office we began to get our compliance house in order. We had been following the rules spelled out in CFR30 Part 57 (for those interested --> Title 30, Code of Federal Regulations, Part 57 Health and Safety Standards Underground Metal Non-Metal Mines) to the degree that matched the scale of our operation. Now, theoretically, we'd have to tow the same line as Phelps Dodge or Barrick Resources. The first major requirement we faced was to cut a secondary escape way. Since we were very near the outside already, this was not as major of a task as it could have been. An initially daunting array of other requirements had to be met: Training,training plans, HazComm, SCSR (self-contained self rescuer) certified training, mine gases, ventilation plans, diesel particulate, radon gas levels, ground control, daily inspections, hearing conservation, travel ways, reporting of hours, evacuation plans, alternate mine rescue..... One by one we chewed out way through the requirements. Needless to say this effort tapped into the time reserved for desk work. Since our CAV we've had at least 10 inspections and have interacted with at least that many DOL employees. On balance, our mine is safer than before all of this started. Encouraged by May 5-08 find, we decided to advance again westward along this horizon. Though we did not detect anything while drilling the burn, clearing out the muck after the shot revealed that the shot itself peeled into some kind of space. 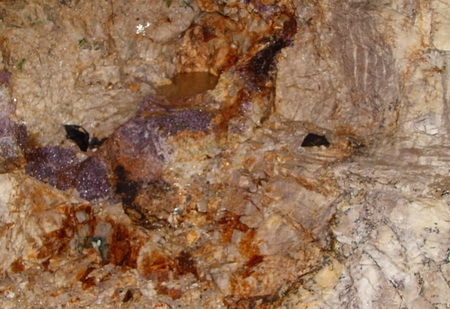 The potential of a substantial cavity was re-enforced by a steady flow of water that emanated from an area of fractured quartz at the back of the burn. Over the next several days we expanded our burn. This effort revealed more small cavities both to the left and right of the original opening at the back. In this image Richard and Frank examine a small space on the right inside the expanded advance. The main chamber opening is behind the bucket and is stuffed closed with a blue tarp. The right hand space did not prove to be productive so our attentions returned to the cavity at the back (MMP7-08). Though the space contained plenty of color in the form tourmaline chips, there was only one tourmaline and it was of minor note. The image to the left shows the tourmaline as it appeared in pocket after a little gentle excavation with our garden house. 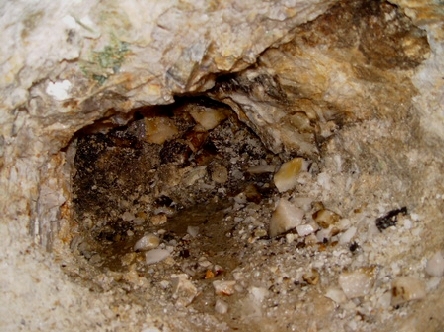 Once dug out, the space was more than a meter wide and at meter and a half to the back. All around it were indications of more spaces. So the digging in this area continued to at least hint at more pockets. Whether or not they'd produce 'revenue rock' was the open question.